One of my favorite scents in the world is calming lavender … its sweet floral and herbal fragrance with balsamic undertones. One of the easiest ways to infuse its intoxicating scent throughout the home is with candles. 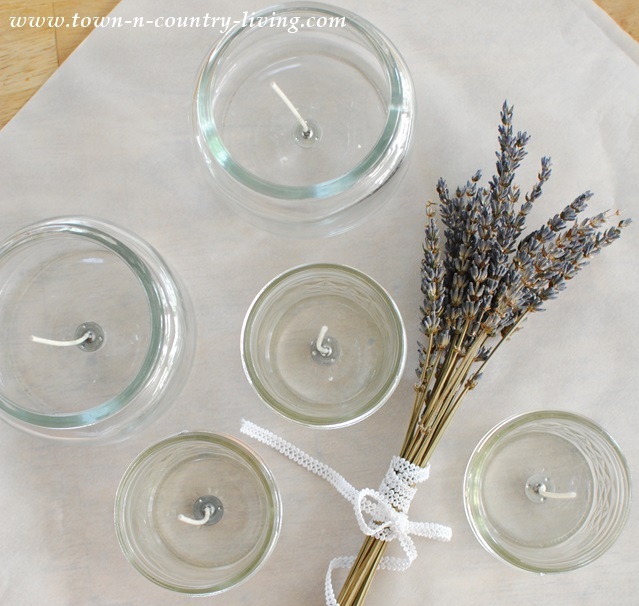 I’ve found that dried lavender doesn’t diffuse throughout a room as quickly and evenly as a burning candle. But good candles with quality fragrance can get expensive, so I decided to make my own lavender candles. PLEASE NOTE: I added lavender buds to my candles but they CAN catch fire once the candle burns down. DO NOT add the lavender buds to avoid any risk. I don’t burn my candles all the way down so it wasn’t an issue for me. Simply eliminate this step when making your own candles. 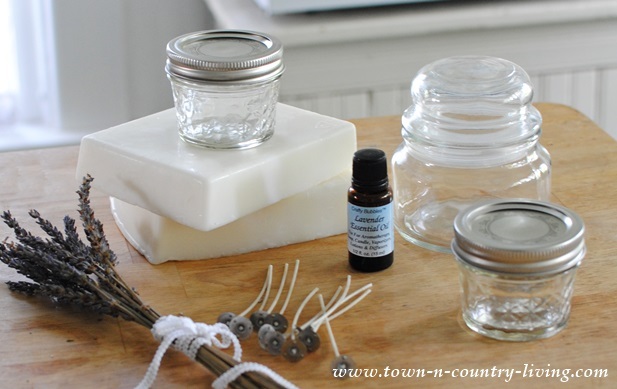 You don’t need a lot of supplies … candle wax, essential lavender oil, candle wicks, candle dye, and glass containers. You’ll find candle making supplies online or at your local craft store. Start by placing wax or parchment paper under the jars to catch any wax that might drip when pouring your candles. Hot glue the bottom of the candle wicks to the bottoms of your glass jars, being sure to place them in the center of the jar. Make sure the wick extends at least 1/2″ above where the top of the wax will be. 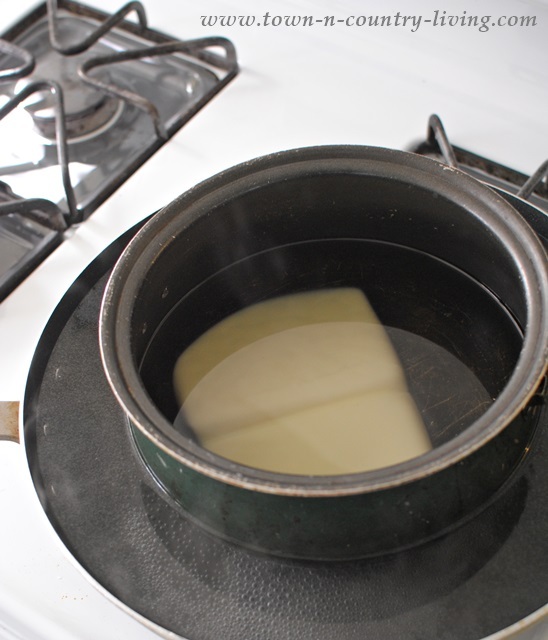 Melt 2-3 lbs candle wax in a double boiler. I don’t have one so I simply placed an old pot that I won’t use for cooking inside a larger pan filled with water to act as a double boiler. Turn the flame to medium or medium high and let the melted wax reach a temperature of 180 degrees. 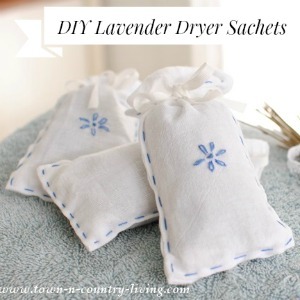 Turn off heat and let wax cool to 125 degrees, then add .5 ounces of lavender oil for every 2-3 lbs. of candle wax. If you’re using dye, add it now. I used small, equal amounts of blue and red candle dye to achieve a soft lavender color. It’s best to add a little dye at a time until you get the right hue. Once it’s too dark, you can’t go back. I added dried lavender buds at this point for looks, but I’ve been told the buds can catch fire (I didn’t experience this issue myself) so DO NOT add lavender buds. Your candles will still smell lovely. Carefully pour the wax into each container – I used a funnel to avoid wax from spilling. 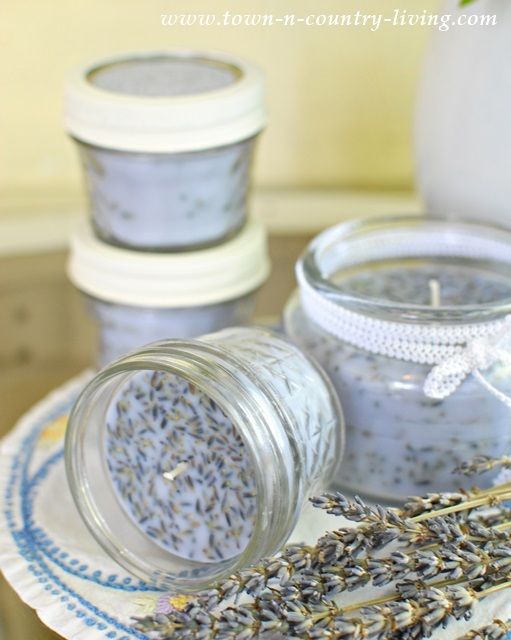 Let your lavender candles cool overnight before using and trim wicks to 1/4″ above candle. 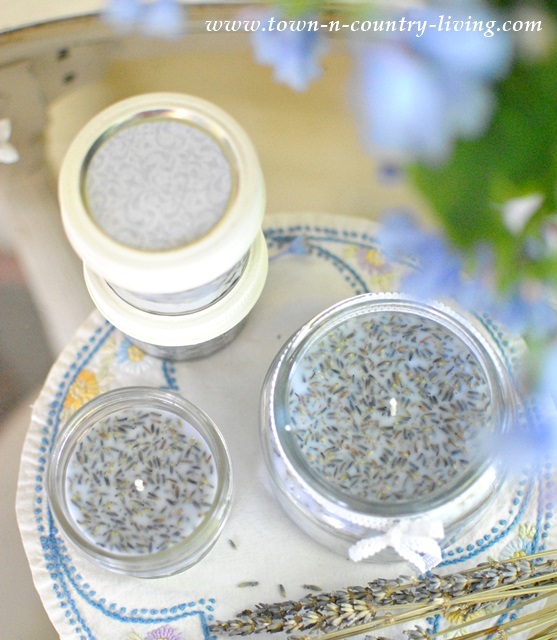 Use new glass jars for your lavender candles, or re-use old jelly jars. Decorate the jar lids and give these candles as gifts. Or keep them for yourself! 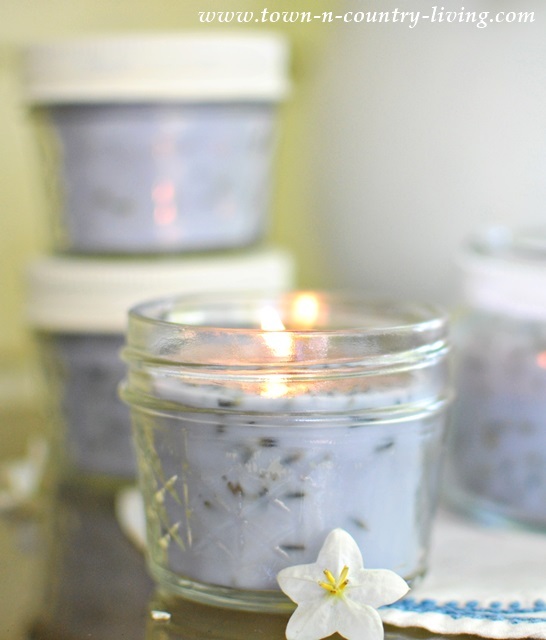 The soothing scent of lavender will fill your home and smell oh so heavenly! My friend broke her foot and is having to stay on the couch for a month so this would be a great project to do with her! Thanks for sharing it! I soooooooooooo want to make my own candles one day. It’s on my bucket list – lol! Seriously, it’s one thing that intrigues me that I have yet to try. These are absolutely beautiful!! I can only imagine that they smell divine too!! These are fantastic Jennifer. What a great rainy day project for me and to have some little gifts on hand!! Think I know what I’m making for my sisters for Christmas. Thank you so much for sharing this project with us! I was wondering can I use bee wax for this DIY? Please let me know. Thank you! 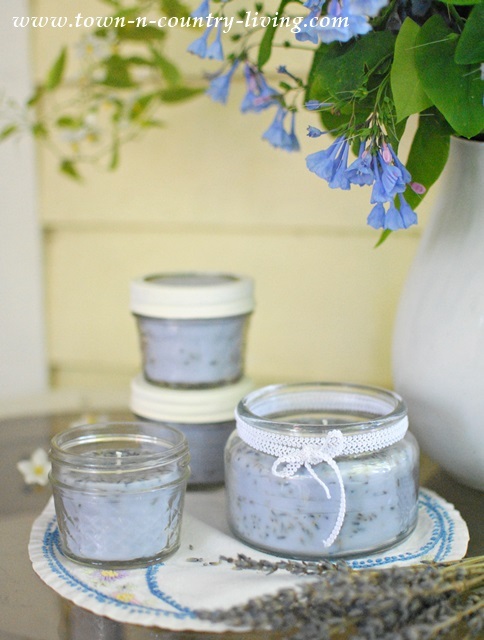 I have been wanting to make lavender candles to add to my lavender products, and want to try your recipe. Thank you for sharing this! Tried this-almost set the house on fire when the lavender buds caught fire after the candle had burned down. Careful! Yes I was scared for that too. Lavender buds will burn…. Kimberly, I’m very sorry to hear this happened to you. I didn’t have an issue myself with the buds catching on fire, but I never burn my candles all the way down. I have altered the instructions since hearing of your experience. Thank you so much for your feedback. Hi, I would like to know if the flower buds will settle down to the base of the jar when the wax are cooling. How do you keep them floating? 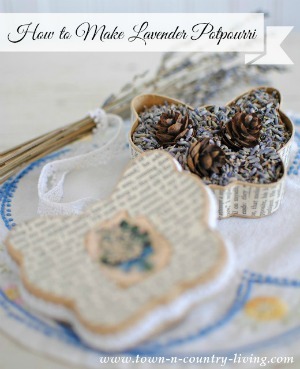 I adore lavender and candles, so I am definitely doing this, Jennifer – pinned and shared on B! These are really cute. They should not be burned though. They are a fire hazard. When you add things into a candle that are flammable it can be dangerous when they burn. So im very wary now.. Thank you for your feedback! I have since altered the post to warn against using the buds. My candles never caught fire but I don’t burn my candles all the way down. I always toss them when there’s still a little bit of wax left. Hi Jennifer, You should REALLY respond to people’s concerns about the flammability of the lavender in these candles. It is irresponsible to keep this project online if there are hidden dangers with the candles that have not been disclosed by you. Please post somewhere in the comments to confirm/deny the danger of adding lavender to the candles. Thanks! Hey I used the lavender buds and guess what they didn’t catch on fire. But if they did I would have toasted marshmallows to then Sophia – Mason jars are amazing.